Have a beautiful bird that's just not as friendly as you had hoped? Does he try to bite you every time you get near him, even though you mean no harm? Show your bird that you're his friend with this taming technique. Capture the bird you're trying to tame as gently as possible using a towel or wearing gloves. You may need an extra hand to do this. Once you have the bird, it's time to clip his wings. Clip them as short as possible without hurting the bird. If you know how to properly clip a birds wings, you can do this yourself. If you don't, however, it might be best to take him to a vet or a professional. Some pet stores will do this, and show you how to do this, for a small fee. Place your bird's cage in a place that the bird isn't familiar with. This location must be quiet and free of distractions for the best results. The bird should be able to focus on you, rather than focusing on other distractions in the room during training. While you're in the same room, open the door of your bird's cage. Leave the cage door open for at least a couple hours. With any luck the bird should feel comfortable enough to step out of the cage and wander about it. If the bird doesn't step out of the cage on the first try, repeat this process daily until he feels comfortable enough to do so. Be sure to place a stick or a perch near the cage during this process to familiarize him with it. Stay in the room with him to let him know that you have good intentions, and that you're there to help. Approach the bird with the stick mentioned in the last step, and do your best to get him to step onto it. Repeat this process until the bird is comfortable stepping on and off the stick. Once he seems used to climbing onto the stick, try moving on to getting him to step onto your finger. With the bird on the stick, get him to step onto your finger. If he isn't intimidated by your voice, say "step up". Once he's stepping onto your finger from the stick without a problem, it's time to start getting him to step onto your finger from the cage. Repeat the same process, just without the stick. It's important to reward the bird with a treat and praise whenever he accomplishes something. It's also a great way to encourage positive behavior. 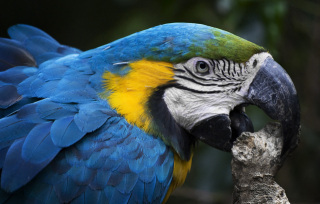 Start by offering your bird a treat at a distance once he starts climbing out of the cage, in a way that he simply has to reach out to get it. Place the treat on your palm, or hold it out to him between two fingers. Move onto offering him the treat in a way that he has to climb onto your finger to get it. While the bird is on your finger, present a treat to him. While he's eating it, gently reach out to touch his breast feathers. If he doesn't jump away, continue to stroke his breast feathers for a couple seconds before you offer him another treat. This process will help him feel more comfortable to your touch. While you're repeating this process, gradually move up to petting his neck, his cheeks, and then the top of his head. Remember to switch between stroking and the treat to reward good behavior the entire time. With this strategy, slowly progress up to the neck, to the cheeks, to the top of the head. Rewarding your bird for good behavior all the way. 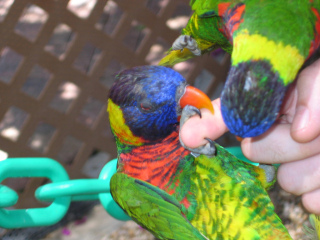 Once this process is complete, you should have a more tame and docile bird that doesn't cringe away from your hand. Be sure not to scold your bird, and give him lots of love and attention.